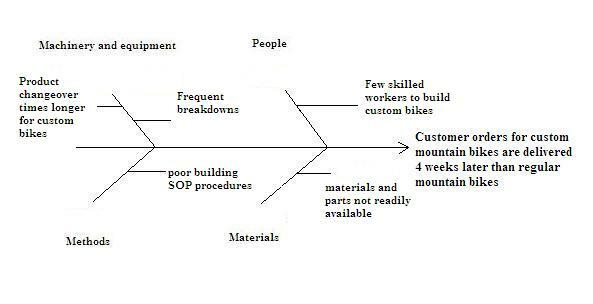 Fishbone Diagrams which are also referred to as cause and effect diagrams, are a problem solving and fault finding tool which facilitates the thought process in dissecting an issue or problem into a standard four contributing sources from which users than think of possible causes of the problem. It is a very useful tool and can be used to analyse problems within operations, supply chain, or any other areas of a business. Below on this page we have carried out a fish bone diagram problem solving exercise step by step. Customer orders for custom mountain bikes are delivered 4 weeks later than regular mountain bikes. 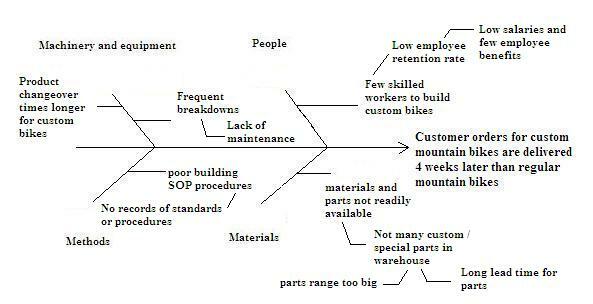 Once the problem statement has been defined, production, warehouse and supply chain data relating to the product in question may be collected in theis case to better identify possible causes. This will make the process of checking the possible causes and theories a lot easier. 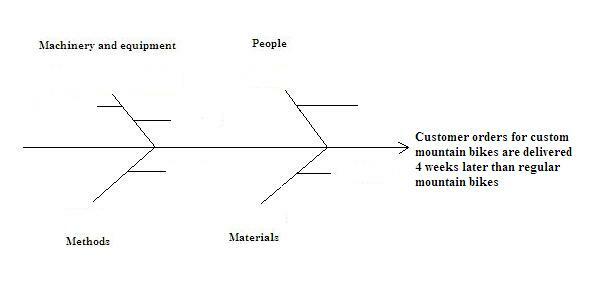 For each of the causes identified in the step above the same thought process is repeated as in step 4 to try and identify the root cause of each cause. This process is similar to the 5 whys approach of problem solving. Each possible root cause or hypothesis is checked for validity with support from production, warehouse, and other data collected along the supply chain to verify its valididty or rule the possible cause asa credible one. Once this process has been completed a handful of possible causes will be proved valid. These should provide a focuss area to address in order to eliminate the problem, issue, or seize the opportunity named in the problem statement.